I have a NEW winner!!!!! Today, I have a fantastic line up! 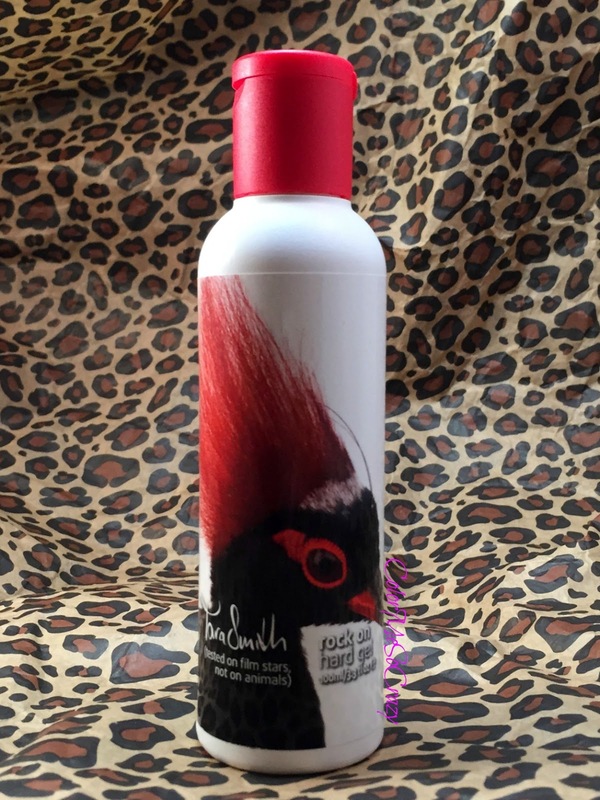 I have an entire line of haircare products from Tara Smith Haircare. This haircare line was born in the United Kingdom and has finally made its way over to us in the US. There are 12 items in this lineup but I am going to make this as short and sweet as possible but trust me on this... there are some super pretty pictures! First up, a little bit about the brand and why it is so good for your mop up top. Tara Smith Haircare is safe enough for everyday use. This is fantastic for me because I was just asking around for something now that I am working out 5 days a week. Full soaked sweat head is not easy to hide with dry shampoo and most shampoos and conditioners out there are too harsh for my hair. The products are Eco-freindly, vegan and formulated with Performance Botanical Technology. The line is also free from parabens, gluten, animal cruelty, animal derivatives, artificial coloring, synthetics fragrances, artificial coloring, Sodium Laureth Sulfate (SLES), Glycol, Phthalates (plasticizer that can cause all sorts of endocrine, estrogen and metabolic issues), PEGs (same ingredient used in anti-freeze)and still smells FANTASTIC!! 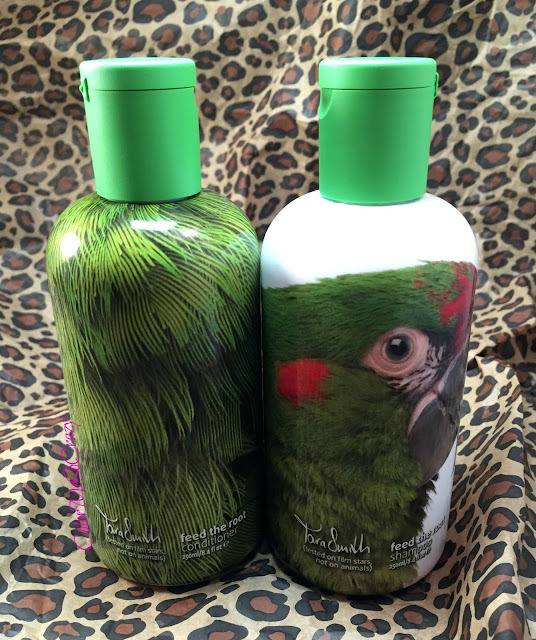 Not only is this product great for your hair, it is great for the environment. A little bit about Tara Smith, the creator. “Be kind, be beautiful, be healthy.” are the words she lives by. She is a 3rd generation stylist and just look at those beautiful locks! She was born to take care of our hair!! Tara Smith truly believes that we can all have "fabulous looking hair". She actually created this line in working with celebrities. They have their hair done with tons of product every day and have to some how keep it healthy. She devised her line in with overstressed and overworked hair in mind so it IS gentle enough to use everyday. 1. Do you have a favorite style product from your line? 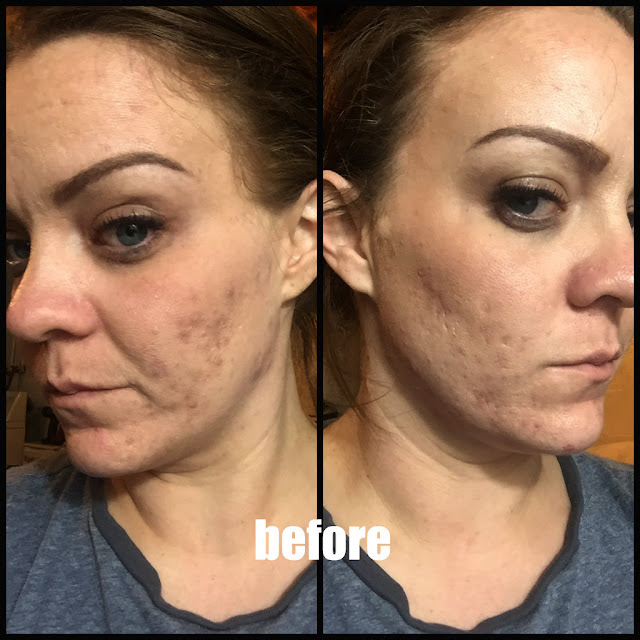 My favorite product and go-to is the Base Coat Serum – I absolutely love this stuff and nothing on the market compares. The Base Coat Serum eliminates frizz while locking in moisture, leaving hair absolutely flawless for up to 24 hours. I never go one day without this in my hair and neither will you! The key to this product is the starflower ingredient, which is rich in essential fatty acids and hydrates hair. This is the ONLY serum you will ever buy again. 2. How did you pick the designs for your bottles? I wanted to do something different that really stood out. Birds are gorgeous animals that symbolize and express freedom. I wanted my products to be thought of in the same way – natural and beautiful. 3. Can you share a hair trick/secret with my readers? If you are short on time and cannot fully wash the hair, grab a hairdryer and massage your roots with your fingers to wake hair up. Apply some Brilliant Thickening Cream and continue to work that into the hair. This cream was proven to increase volume by 85% and will create amazing definition. To finish off the look, spray some Shining Moment Glosser to revive and add incredible shine. So... on to the products. 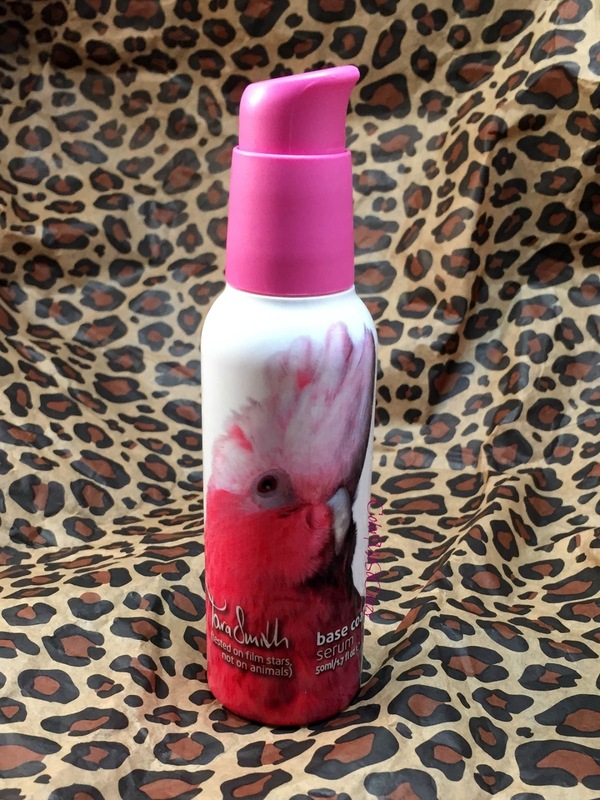 Bird On the Bottle: The bird on the bottle is The Galah Bird. It's from Australia and its feathers are soft, bold and colorful. Bird on the Bottle: The Cockatoo is originally from Australasia and its feathers are confident and boastful. Rock On Hard Gel - This a serious styling gel made up of Oligogeline (comes from red seaweed) and ACB Biochelate 5 (a complex of 5 essential minerals- silicon, magnesium, copper, iron and zinc). It doesn't leave that flaky white stuff either. I actually gave this to my 10 year old to use because he's a big man now and into doing his hair. I don't use gel much, but he uses SO MUCH of it. lol! He actually liked the smell and loved that it makes the front of his hair stand up! It gets an A+ in his book. You can pick this 3.3oz bottle up for $18. Bird on the Bottle: the Crested Wood Partridge is from Southeast Asia and has high and glossy feathers. Brilliant Thickening Cream - This is a leave in cream to give you a little extra body in your hair. It creates volume, hydrates, strengthens, detangles, and softens as well as help protect from UV rays and thermal damage. This is very similar to a 10 in 1 that I currently use and I will be switching over to this permanently once I run out of that bottle. I love this stuff! I used it right after my shower and it made my hair feel awesome immediately. I don't necessarily use the Brilliant Thickening Cream for the thickening components but for the protectant and strengthening qualities it has. This is made from Sunflower Seed Oil, Avocado Oil, Babassu Seed Oil, Panthenol (a vitamin derived from Vitamin B5), Sweet Almond Butter, Illipe Seed Butter, Mango Nutter, Quince Seed Extract, and Aloe Vera. I mean that's a whole lot of great stuff!! You can grab this 3oz bottle for $24. Bird on the Bottle: The Male Indian Peafowl is from South Asia and is the national bird of India. It has extravagant and regal feathers. 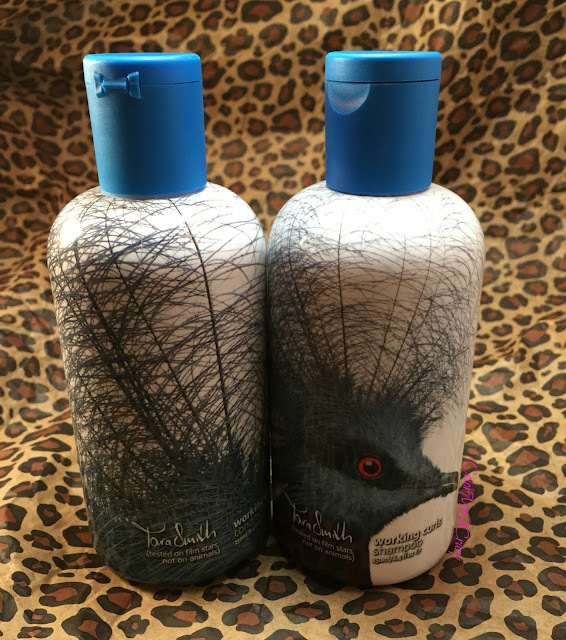 Feed the Root Shampoo & Conditioner - This is my favorite combo and I also happen to be giving away this duo at the end of this post! It is a volume booster, a shine intenser and a strengthener. The ingredients work at the root to promote a healthy head of hair. They include Bamboo Extract, Tea Tree Oil, Avocado Oil, Oleyl Erucate, Olive Squalane, Oligogeline, Panthenol and ACB Biochelate 5. You can pick these 8.5oz bottles up for $16 each. Bird on the Bottle: The Red-fronted Macaw comes from South America and is known for it's thick, healthy and lush feathers. 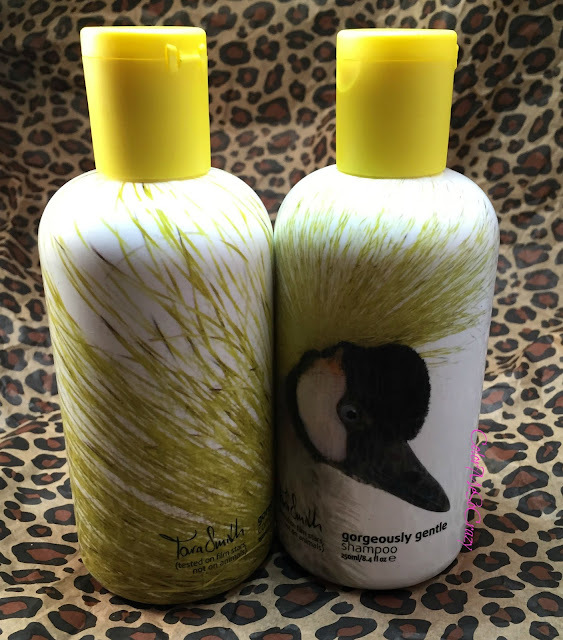 Gorgeously Gentle Shampoo & Conditioner - This would be your regular shampoo and conditioner set. It helps those of you with easily irritated skin. This would be my daughter. She has such sensitive skin and I only use organic, all natural, vegan ingredients on her because she is sooooo sensitive. I am constantly label reading with her products. While this is gentle, it still strengthens your locks. Some ingredients include hydrolyzed Sweet Almond Protein, Panthenol, Bisabolol (active compounds in chamomile), Aloe Vera and Oligogeline. You can pick these 8.5 oz bottles up for $16 each. Bird on the Bottle: The Grey Crowned Crane is originally from Africa and its feathers are delicate. Shine On Shampoo & Conditioner - This is the other set that I will be using on the regular. I do have chemically treated hair, while it is not that dry it is still treated so this will help restore some of those nutrients that are stripped out of my hair when I take them all out. Don't forget... I do have the BEST stylist in the WORLD!!!! Anyway, this restores your hair with Ginkgo Biloba Leaf extract, Oleyl Erucate, Oligogeline, ACB Biochelate 5 and Flexiquat V (this is the vegan, animal friendly, gluten-free version of Keratin). You can scoop these 8.5oz bottles up for $16 each. Bird on the Bottle: Originating from Australasia the Palm Cockatoo has sleek, edgy and strong feathers. 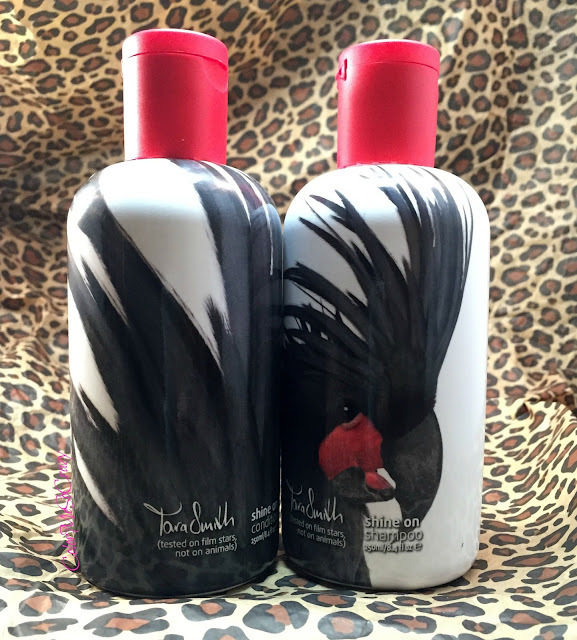 Working Curls Shampoo & Conditioner - While I have naturally curly hair, I hardly ever wear it curly. I will probably be gifting this to my sister who has very tight curly hair. This will help hydrate, tame define, soften, and shine her curls.The ingredients that help with that are Soy Protein, Panthenol, Organic Rosemary extract, Oleyl Erucate, Olgogeline, ACB Biochelate 5, Flexquat V and Zenigloss Q ( derived from castor oil which conditions and detangles). You can pick both 8.5oz bottles up for $16 each. Bird on the Bottle: The Southern Crowned Pigeon is from New Guinea and is known for it's wild and unruly feathers. Overall, I am really impressed with this line. I love the smells, the looks, and the feels of all of the products. 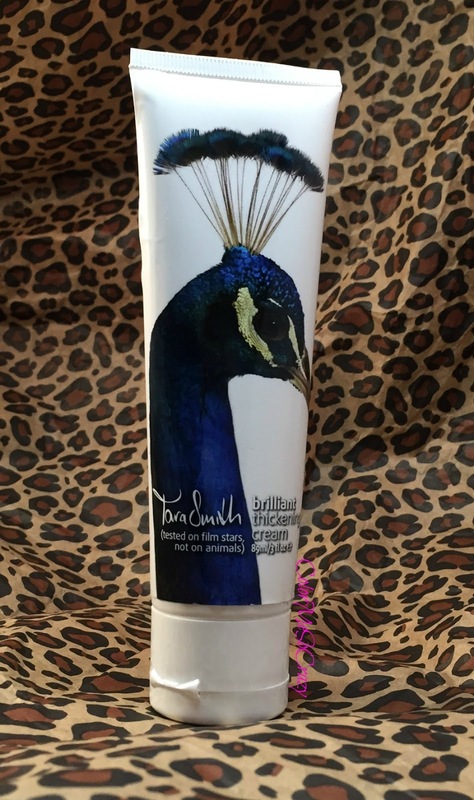 The message of Tara Smith Haircare is just awesome, as well. I am super impressed with just about everything with this brand. This line launched at the beginning of this month, so you can pick up any of these products shown here by clicking on any of the links in the post. ON TO THE GIVEAWAY...All you have to do is leave a comment below. That's it! Tell me which one of these bottles you think looks the best AKA which is your favorite bird from the collection and why. That's it. This will run for 22 days so I will end it on 8/25 at midnight.